Expect to be out sightseeing from 9am to 2pm. Lunch will not be included with the tour. You should also be prepared to claim check your luggage with the hotel, that isn't going on the trek. After the sightseeing tour the race meeting will be held. We will depart by plane for the short 45-minute flight to Lukla airport. We will be camping tonight in Lukla. The time in Namche will be spent getting acclimatized. You will be guided on day hikes and some running will be possible. From Phakding after crossing the suspension bridge over the Dudh-Kosi, the walk is pleasant with few short uphill and downhill and re-crossing the same river again, with magnificent view of Thamaserkhu 6,608m,from the village of Benkar, cross the long suspension bridge over the Bhote-Koshi river, after the bridge on this busy trail of trekkers and Ghopkyo and porters, finally we arrive at a small village of Monjo after the last 20minutes climb from the stream, where you can see interesting water-mill grinding roasted corns and barley for Tsampa, one of the staple food of the Sherpas, Tibetans and other mountain people. Monjo is situated below the magnificent peak of Thamaserkhu and near the entrance of Sagarmatha National Park. After few minutes walk from Monjo, comes to the entrance of Sagarmatha National Park, where your trekking permit especially the park ticket is checked and keeps the record of all trekkers going to and from this place including the local trekking staff as well, if you have a video camera please let them check, for a normal home video camera is free to carry and shoot inside the park, but for bigger commercial camera a fee of US$1000 is charged. From here a short descend and a gradual walk brings us to the suspension bridge over the Bhote-Koshi river, after the bridge Jorsalle village is reached, the last village and the only place to shop till Namche Bazaar is reached, after a short walk, a second bridge is reached over the same river, the walk is pleasant on the river bed till the last bridge over the Imjatse river is reached, from here the walk is along the winding uphill path all the way to Namche Bazaar, with magnificent view of Kwangde peak and its other sister peaks towards east, with Kusum Kangru on the back as you climb higher, view of Mt. Everest- Nuptse wall, Lhotse and the closer view of Taweche peak can be seen all the way up to Thop Danda, where there's a resting stone wall for the porters and trekkers few years ago a teahouse existed here, from here another 1-2 hour walk up brings us to the famed most talked about place Namche Bazaar, the colourful houses are situated in an amphitheater U shaped bowl. The walk is fairly easy for the first half, after a 20 minutes climb to the top ridge of Namche Bazaar. Once at the top near the park museum the walk follows on the gradual trail with few short up and down overlooking magnificent view of the great giant snow peaks from Everest, Nuptse, Lhotse, Ama Dablam, Thamaserkhu and Kwangde-ri peak after a pleasant walk of two hours coming to a small place at Shanasa. On this area there is more chances of seeing the beautiful colourful Danphe pheasant (Impeyan Pheasant) national bird of Nepal and the elusive musk deer, and sometime even herd of Himalayan Thar (mountain goat like large antelope) from Shanasa with short up and downhill. The trial descend to Imjatse river at Phungitenga 3,250m, a small settlement with couple of teahouses and a small Royal Nepalese Army barrack serving as park wardens in the midst of the alpine woods of mostly silver fir blue pines, rhododendron and some few magnolia and birch trees. At Phungitenga there's an interesting prayer wheels propelled by water, from the nearby streams, the walk from here is strenuous for an hour on the winding trail through the shade of woods till a small religious monument of prayer stones covered with rhododendron leaves and junipers is reached. From here the walk is gradual uphill for another hour, with great view of the close peaks of Thamaserkhu and Kantenga. Kantenga from this angle looks more like an icy Sphinx or a big cat on a sitting position, just before the great spot of Thyangboche you will be assured by a religious Buddhist entrance gate, that the walk is over for the day as you approach and admire this great religious symbol with relief. Thyangboche is one of the most beautiful places in the Himalaya. The first thing that comes to your eye is the big Monastery or Gompa, then the large field with campsites and teahouses, lodges beneath the towering majestic beautiful peak Ama Dablam with Everest looming above the Nuptse wall in the north with Mt. Lhotse and Lhotse Shar towards north east and more peaks all around you. After a wonderful time at Thyangboche, the trail descend through a forest of birch, fir, juniper and rhododendron and coming to lovely spot at Deboche 3,650 m with magnificent view of Mt. Ama Dablam, Mt. Everest, Nuptse and Lhotse, from Deboche walking past the long prayer mani wall, the path is gradual till you reach a small bridge over the narrow gorge of Imjatse river. From here the walk is gradual uphill most of the way, as you come to a large mani wall gate, a little farther from here the route diverts into two ways, the upper one going to the upper Pangboche village, where the old Monastery is located. 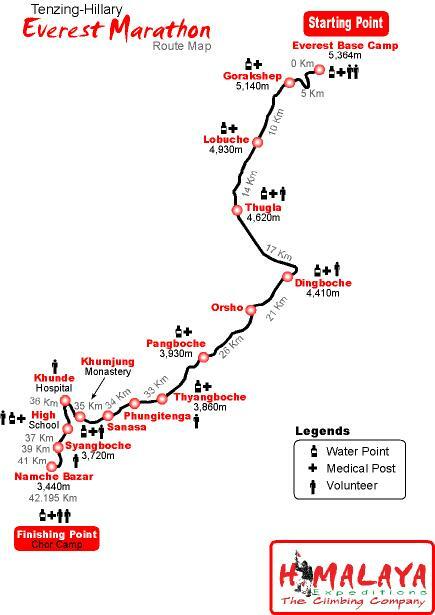 The gradual low route is the straight forward main trail to Dingboche, Pheriche and beyond. It will be better to go the upper trail, for more view and to visit the upper Pangboche village 3,900m and its Monastery, which had a Yeti scalp, and a skeleton believed to be Yeti's hand, it was stolen in the early '90's, and has never recovered back again, like the monastery in Khumjung. This Monastery is believed to be older, after the visit to the Monastery a gradual walk downhill brings you back to the main trail, with a short climb to Shomare for lunch. Shomare is a small settlement with fantastic close-up view of Ama-Dablam, from here Kantenga peak looks different from its northern face. After a pleasant break here our journey continues gradually towards east, after an hour walk, before a small wooden bridge the road splits into two ways, the north going to Pheriche and our trail leading towards east beneath towering north face of Ama Dablam, from here onwards Ama Dablam looks completely different, from the bridge. The trails climbs slowly winding above the Imjatse river, till we come to a big mani Stupa, from here onwards the walk is fairly moderate as you enter the Imjatse Valley beneath the mighty peaks of AmaDablam, Nuptse and Lhotse with view of the eastern snow capped mountains including the Island peak or Imjatse 6,189m, which is a popular peak amongst all the trekking peaks in Nepal. Dingboche is a beautiful patchwork of field enclosed by stone walls, protecting the crops of barley, buckwheat and potatoes from the cold winds and grazing animals. Dingboche has about more than ten teahouses and it is also the gateway to Chukung and farther beyond for the most challenging traverses towards Makalu area and Hinko Valley via Sherpani col 6,100m and Amphu Labtsa 5,780m. From Dingboche the trail diverts towards north, the path is gradual up for about 40 -50 minutes as you come to a mani-prayer Stupa. From here the trail is gentle on the hard meadow looking down below Pheriche village. Today's walk offers beautiful view of the Mt.Tawache, Ama Dablam and to the north Pokalde 5,741m, Kongma-tse 5,820m and the great wall of Nuptse. After a pleasant walk of 1 1/2 to 2 hours the trail from Pheriche joins near Thugla, before a small wooden bridge over the torrent river of Khumbu glacier. Thugla is the only place with teahouses before Loboche. From Thugla, an hour steep up brings you to the top, where you can view Mt. Pumori and other peaks west of Everest. The spot here is good place for a few minutes break after the strenuous climb, close to this spot you can also see a number of memorial of the unfortunate climbers, who died in expeditions around the mountain of this region. From here another 1 1/2 to 2 hours of gradual ascend brings you to Lobuche. Lobuche comes as a surprise, as it is situated in the corner well hidden and sheltered from the wind. Lobuche has about 5-6 Teahouses. Today is the day for your final destination of this adventurous journey. The first hour walk is gradual up the valley at the end of the grassy field, a short 20 minutes climb, the walk from here follows the rocky moraine path, as you walk you can see the icy-glacial pond and icebergs down below of Khumbu glacier. After the last rocky moraine dunes a short downhill walk bring you to Gorakshep on the flat field below Kalapatthar 5,545m and Mt. Pumori 7,145m. Gorakshep has two teahouses, and it used to be a base camp in the early 50's expedition to Mt. Everest. After a break here at Gorakshep we continue towards Kalapatthar, a few minutes of easy walk on the sandy field, then a steep climb for 45 minutes brings you to the near level field. The walk from here is gradual till you reach the rocky spot after an hour, from here another steep climb to the top for another 1/2 hour. After reaching the top, you will feel glad as you achieve the moment that you have been dreaming since the beginning of the journey. Top of Kalapatthar is a small rocky peak on the southwest ridge of Mt. Pumori, the view from here is beyond imagination as the Everest looks within a stone throw distance, between the summit of Nuptse and Lho-la and Lhotse on the back. The panoramic view from this spot is something to cherish, and you feel its worth the hard climb up to here and to feel at the top of the world, with all the higher snow capped giants that dominates all around. It is truly a magnificent spot to be here on a clear sunny day to view an array of mountains up in the far horizon, to the south Khumbu glacier sweeps below you, and you can also see the Everest Base camp down below on the moraine of Khumbu glacier, when the expedition season is active. Afternoon can be very windy here, after a great moment with the panoramic view descend for the overnight at Gorakshep. The final day of this great adventure, continues towards Everest Base Camp and to the Khumbu Ice-fall. The path from here can be misleading, follow the lead Sherpa. Every year the trail changes due to the movements of the glacier and the walk is quite strenuous due to the high altitude and thin air. The walk passes through over rocky dunes and moraine and streams, till you reach the base camp. Everest Base Camp is lively with commotion during the high expedition season. NON-RUNNERS SCHEDULE Today non-runners will head back down the valley. You will not be going to Everest Base Camp. Tonight's camping at Shomare. NON-RUNNERS SCHEDULE Today non-runners Will head back to Namche. We'll try to reach Namche today. MAY 29 - RACE DAY - RACE WILL COMMENCE AT 7AM. 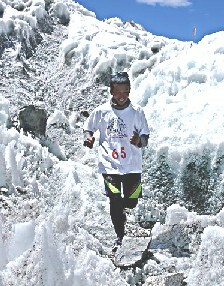 Non-Runners Schedule: If we didn't reach Namche yesterday late afternoon then we'll be in Namche early this morning. First runners should come in around 10:30 am. See map of race course. You will be escorted by van back to the airport for departure. Instructions for clearing immigrations will be given.